Twenty years ago, I could never have imagined that vegetarianism and mindful eating would be as mainstream as they are now. You can tell that times have changed from the availability of meatless options in grocery stores and restaurants. We veggie people are still a minority, but the “brown rice and kale” hippie stereotype has receded. 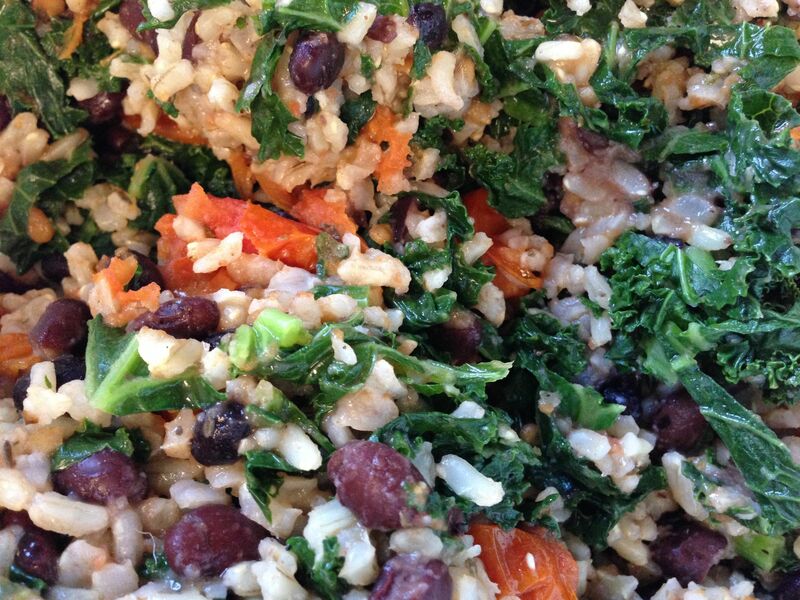 It so happens that I love brown rice and kale. Just as many people aspire to a meatless day every week, I aspire to a weekly vegan dinner. My favorite vegetables are leafy greens. I developed a taste for them after discovering rapini. Kale is not as tender as rapini or spinach. I chop it into thin ribbons and microwave for three minutes. That usually does the trick, and retains the nutrients I would otherwise lose by blanching it. 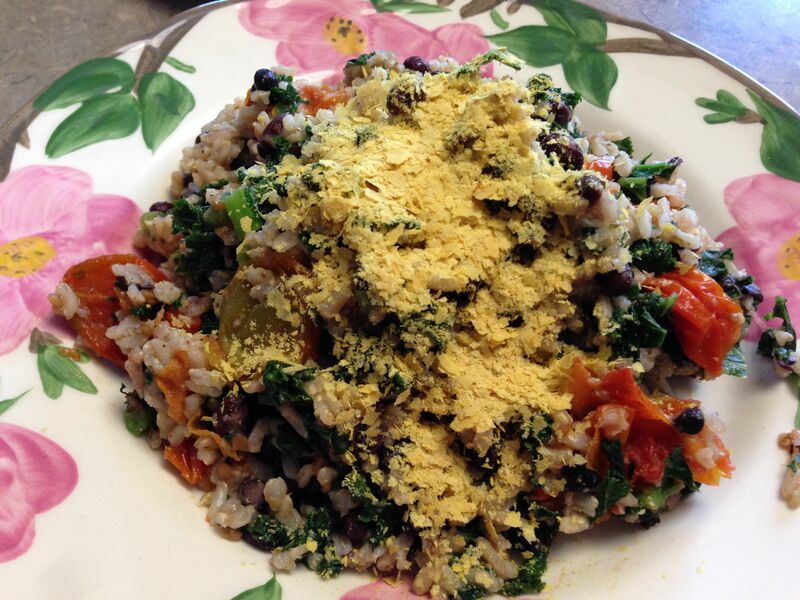 For this meal, I made brown rice in my rice cooker (essential equipment for vegetarians!) and folded in the kale, a can of black beans, and the last of my precious roasted tomatoes, frozen from last summer’s garden. The juicy tomatoes were loaded with herbs and salt, so I didn’t need to add much seasoning other than a few twists of fresh-ground black pepper. Instead of garnishing with cheese, I used nutritional yeast. Mmmmmm. I have a heavy hand with the garnishes. LOL. With a meat-heavy meal, you need your green veggies! Uber healthy looking plate there, I love me a bit of brown rice. Cute post title too LM! I love kale! 🙂 and brown rice! 🙂 Mmm i shredded kale and dressed it and left it in fridge for 1 h to soften up a bit. Wonder how i could replace 3m in microwave ( as i don’t have one, never have and probably won’t get one…) Maybe steaming it in a Chinese steamer for 1-2 min would do the trick, so it is not sitting in the water. Tomatoes , especially roasted ones are in my book as great as cheese. But i am intrigued by the nutritional yeast! I love dairy,all of it but trying to reduce intake of cheese a bit because of fat content (and no, half fat cheese is not the point, doesn’t taste nearly the same 😉 ) so i’m always looking for tasting things to sprinkle on that are not cheese. So how does this taste and where could you buy it? Yes, steaming would work as well as the microwave, no doubt. As to where you can buy it, I would try stores that cater to natural foods lovers or vegetarians. Especially places that sell staple foods in bulk. If you try it, let me know what you think! Brown rice is hit or miss for me. It’s easy to dry it up. I’ve never really enjoyed the taste of red meat, other than the occasional burger, but black bean burgers and tofu patties are definitely in. I use a rice cooker with more water than the directions say, and it produces a nice, moist grain. Throw some of that in your black bean burger and it will be extra chewy! I was a red meat lover in my carnivore days (many years ago), but I don’t miss it because there are so many other wonderful things to eat! That is one delicious looking bowl of happiness you’ve got going on there, Linnet. I truly adore kale–so much so that I’m beginning to think my skin has taken on an unhealthy tinge of moss. And brown rice, or millet, or quinoa or buckwheat–those guys I can eat by the bucketfull. I slap on some hempseeds and smother with nutritional yeast, and viola. Pig heaven (minus the pig). Why could you not have been one of my children? LOL. The child who loves kale and nutritional yeast probably goes by the name of Stepford. But I think you are even more off the deep end than I, who refuse to eat quinoa unless it is prepared by Peruvian chefs. I find those little squiggly things in it unnerving. Unhealthy tinge of Moss? Never in life!!! This dish would be right at home for me, here in “enlightened” Seattle.